There's no better feeling than when a cute letter from a fellow blogger drops through your letterbox in the morning! 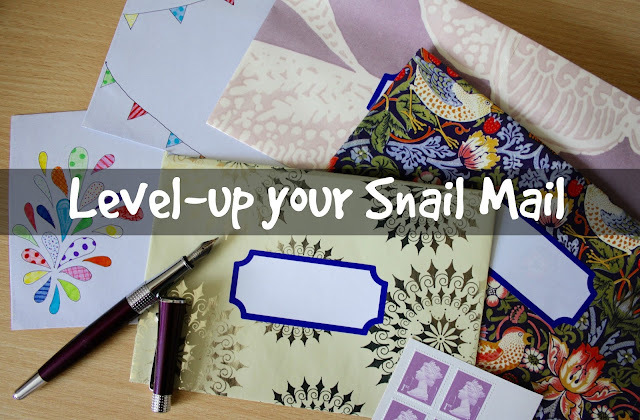 That's why I'm part of the #beechat snail mail programme, which pairs up like-minded bloggers who send handwritten letters to each other. As bloggers, we naturally all love stationery and pretty cards and envelopes. 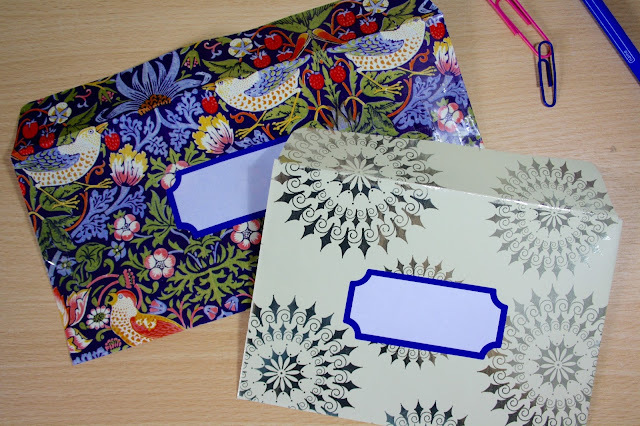 But instead of shelling out half your wages in Paperchase, why not make some beautiful envelopes of your own? You'll be surprised at how quick and easy the process is! What's more, you probably have everything you need at home already! 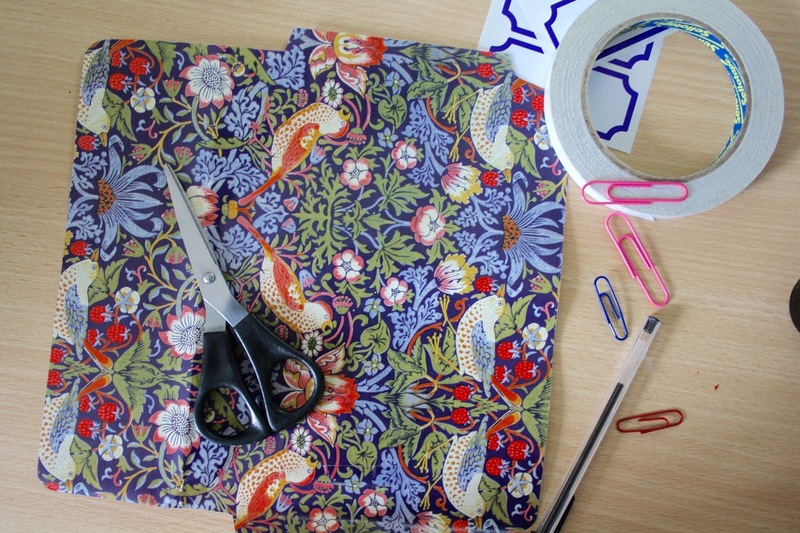 I like to make my envelopes out of used gift wrap - it's a great way of recycling that beautiful wrapping paper! Step One: Lay out the gift wrap patterned-side down on your table. 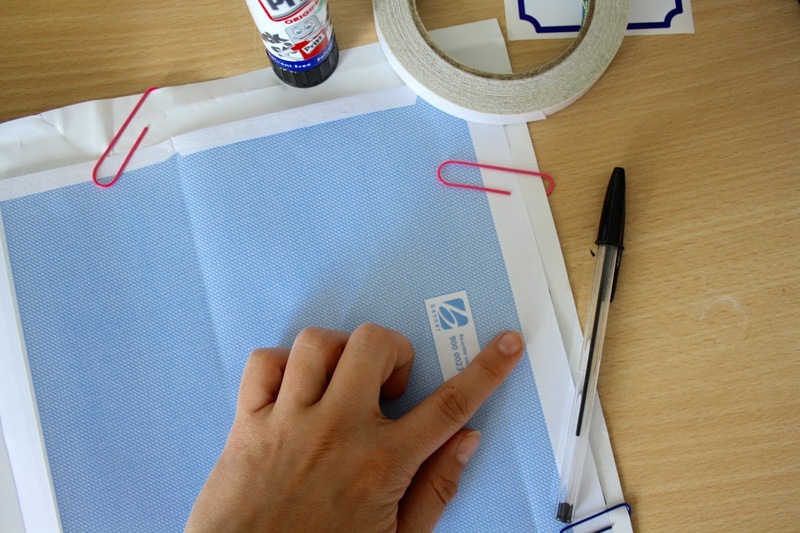 Then take your plain envelope and gently tear it apart at the seams, making sure that all of the little tabs lay flat. Place it on top of the gift wrap. You can secure it in place with paperclips if you like. Next, take your pen or pencil and trace around the circumference of the envelope. It doesn't matter if the line that you draw is super messy! This will end up inside the envelope and you won't even see it! Step Two: Lift off the plain envelope from the gift wrap. If you've traced it correctly, the outline of the envelope should be there on the gift wrap. Now cut out the outline that you have just created. Flip it over and it should look something like the image below! 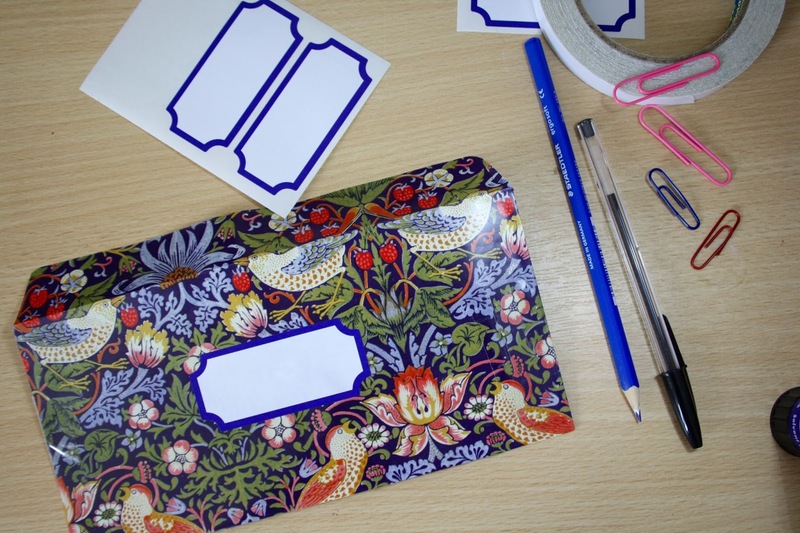 You should now have the outline of a beautiful, colourful envelope! Step Three: Fold down the tabs at the side of the envelope, as shown below. 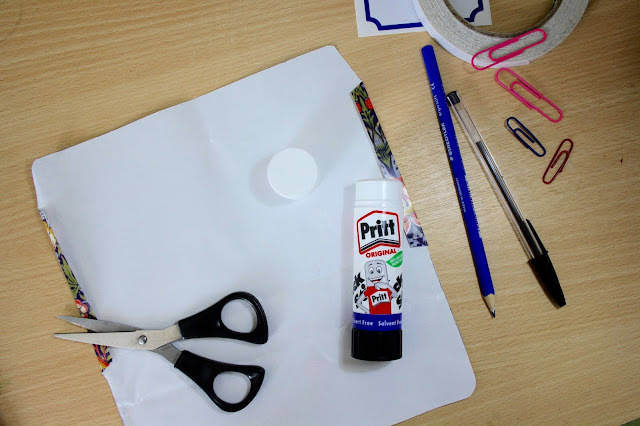 Put some Pritt Stick or double sided sticky tape onto these tabs, then fold up the bottom section of the envelope and stick it to the tabs. 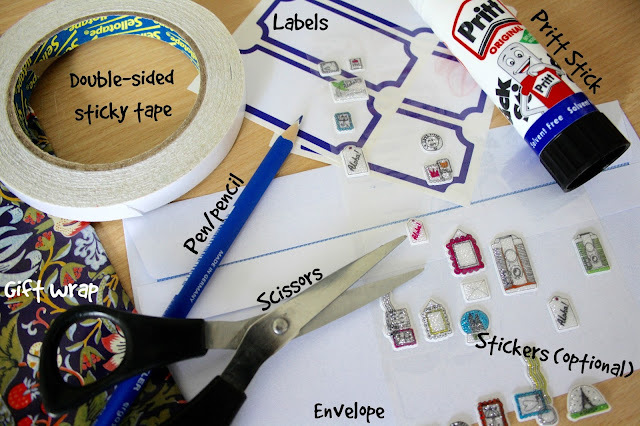 Make sure not to get glue anywhere but on the tabs, or you won't be able to put anything inside the envelope! Step Four: Your envelope should now look something like this! Now you can stick a label to the front, which will allow you to write on the recipient's address. Once you've written your letter, use more double-sided sticky tape to seal the envelope, or a fun sticker, if you have any lying around. You can use pretty much any paper you like for these adorable envelopes. They're super eye-catching and effective, as well as being lots of fun to create! Once you get into the swing of things, it's easy to make several envelopes in no time at all. Wouldn't you love to see one of these dropping through your letterbox? If you don't have any gift wrap around to use, never fear! 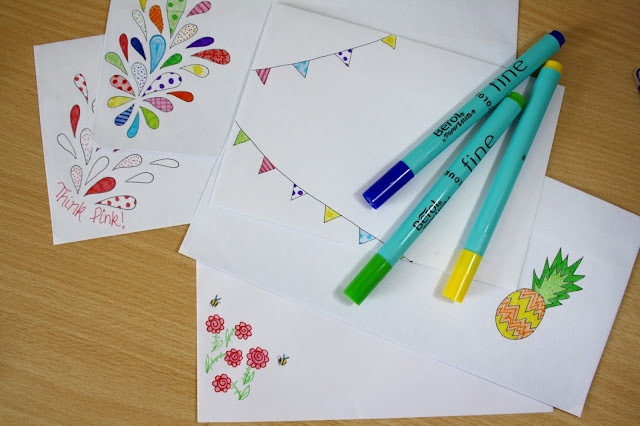 You can decorate plain, boring envelopes with a set of marker pens and pencils! Simple designs such as the bunting or the brightly coloured teardrops I've created below are the most effective. Just don't forget to leave space for the stamp! If you were inspired by this post to create some envelopes of your own, please tweet me a picture, or tag me on Instagram! And if you're interested in joining the fabulous #beechat snail mail programme, head to their Twitter page and send the lovely Charlene, who runs the account, a direct message.